Reduce the sun/moon shadows solve the problem too/good. That's usually not a good idea. Instead, add a light or two to brighten up the shadows. Or use filler lights. They should be set to cast no shadows. Ok and thank´s, i will try this. You're welcome. There are three things that should only be used with utmost care: ambience, sky dome colour (set it black) and sun/moon shadows lower than 100%. Ambience tends to make objects glow, sky dome is a radial in the zenith that does not cast shadows and penetrates everything, shadows lower than 100 makes objects partly transparent for light. ok things are coming along ok, I think, banana's and the pear could use spots, but I'm not sure how to do so, every attempt so far has had me pulling my hair out.. probably need a few more tutorials. 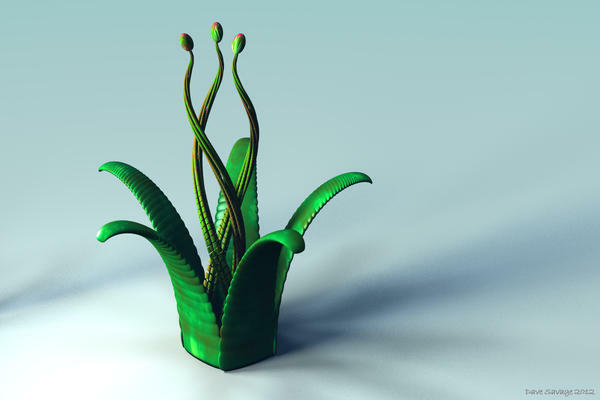 Another alien plant made out of meta-balls and cylinders. Feed me Seymour! I'm a mean green mama from outer space!!!!!!!!!!!!!!!!!!!!!!!!!!! Rareth, nice work on the fruit!! thank you, final image (well for now) is 40+ minutes left on the render, (256 rpp, TA, soft shadows) looks pretty good, grapes need work, since they should be fairly translucence, but they look ok. will post the image when it's done. It usually takes years upon years for most Bryce users to learn these lessons about lighting in Bryce. The problem in Bryce is that the bad lighting tools are more accessible than the good lighting tools so people dont often notice them or learn to use them. 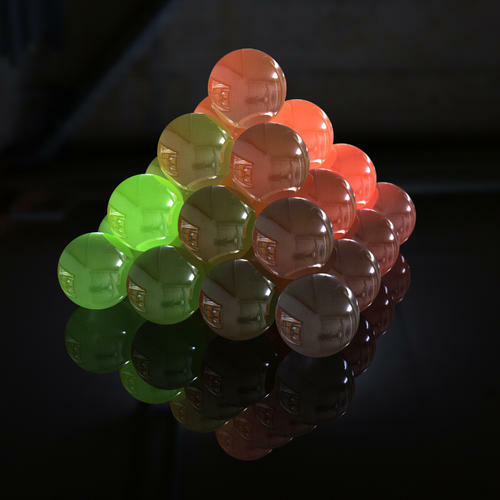 If you get your eye trained to like the look of ambient glowing materials and non shadow casting lights then it can be hard to break the cycle...that is until you attempt your first still life recreation and you realize there is no real world equivalent for the ambient channel. Yes, as Horo suggest, play around with other forms of indirect lighting and the results will be better. Light benefits from shadows so disable shadows only when you absolutely need to. It also doesn't help newbies that the default sky and the majority of library skies have 90% shadows and a lot (most) of the default library materials have ambience in their material set up because they were made to utilise the less complex Bryce lighting system. Yep, I agree completely. There is a forum poster who I dont get along with very well at all (will not name him) and it all is based on my view that the ambience and skydome features are detrimental distractions causing many new users not to seek better forms of indirect lighting. Ambience is just so easy, so darned accessible, how can a newbie ignore it? During the last dev cycle myself and others begged that the default gray material in B7 not have 19.6% ambience attached to it like it used to in B6 and earlier, and indeed in B7 default gray has no ambience. But boy, when this peer of mine first saw that we had taken the ambience away from the B7 default gray, he flipped out and told me I was clueless about lighting and was better off the shut up and stop spreading misinformation. He says the Bryce render engine is designed for ambience and that one cannot accomplish realism without at least 19.6% ambience. I know, strange stuff. My view is that he allowed his eye to get accustomed to a certain type of look, and cannot break out of that. Which I think is a shame of sorts. But that's just me. Anyhow, the point I am making is that ambience is brilliant but is only required in a small set of circumstances, not for every texture as the material library would suggest. Yes, the material library is VERY misleading about this issue. Agree 100% with your sentiments! Sorry, but here is a picture to laugh. 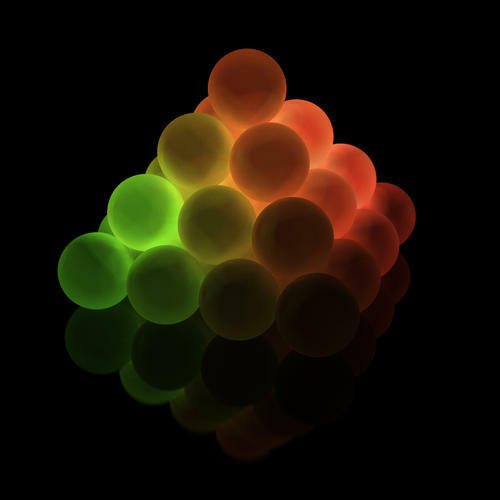 Seems you are finding pleasure in playing with meta ballz. Pleasure and frustration, but most of that frustration is with the 'multi replicate' settings getting the stalks to bend the right way. @Dave: The first four leaves look as though they've just been picked. They look very nice. Your next plant also looks very good. And innocent. 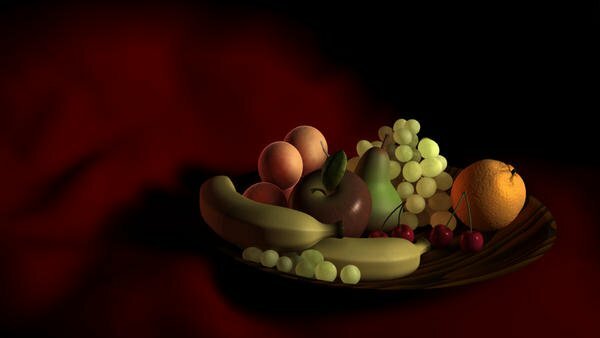 @Rareth: Development of the fruit plate has been interesting. Whether purple or green, they do need a bit of a translucent look. However, there are grapes that do look like the ones you've produced. That one looks really excellent. I agree with Horo - "The grapes will be the greatest challenge to to get right." Some grapes take on a ‘bloom’ (known as ‘cutin’ - oleanolic acid for preserving moisture loss) effect, so I would imagine it will be hard to achieve (as, too, with the peaches, which should also have a furry-like finish to them). Btw...I love your cloth effect -very nice (I wonder would applying such a similar-type mat to the peaches give you that 'furry' finish - as above mentioned). and some take on yeasts. The cloth just has a very high frequency noise applied to it for bump at a very low bump setting, the problem with Peach Fuzz is its white and peaches are not. Here is the fruit plate from over a year ago, when I did it in Carrara, and you can see the difference.. I think it's coming along great and I like the red fabric on the earlier render, that's great looking felt! I think the 90% shadows thing on all those presets is due to them being very old (even before TA old), and setting the shadows to such gives a more natural look to a basic render without all the goodies we have these days. 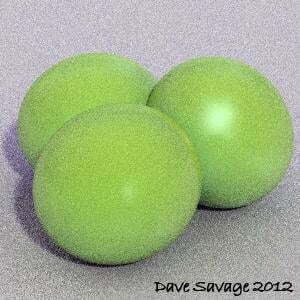 It gives the impression of better light in the scene when using just basic ray-tracing. They could do with an update for sure. If there were any grapes I'd have eaten them! Yes not yet. Interesting idea about TIR. Yes, maybe... what I'm testing now, and this is the point really about doing it via reflection and ray depth - in theory it might be possible to achieve a kind of SSS using only one surface mesh. Which would offer distinct advantages (but probably not speed unfortunately) for ease of use with complex mesh objects. Like say - dragons... or even Vicky... a bit too early to say yet... I'm not getting my hopes up for skin... but it's worth trying. Running another test now. Should be "slightly" more efficient. Maybe 1/3 of the previous render time with a bit of tweaking. 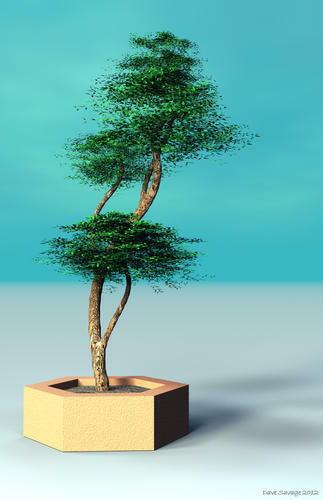 @Dave: That's a nice looking Bonsai tree. Used in the right setting it could also be the center point in a courtyard of a home or business. @Rareth: The grapes made with Carrara look really good.